Her designs - instantly recognizable by their imagination, optimism, and humour - set the stage for this latest creative endeavour. 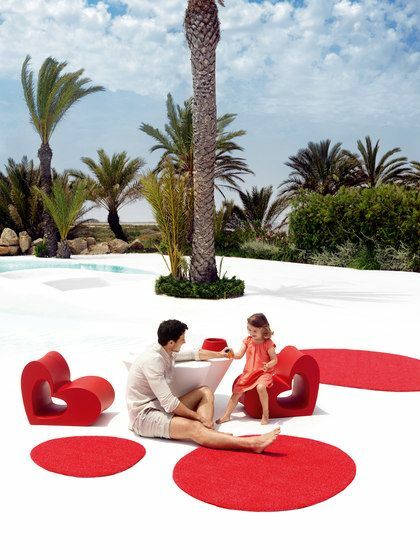 Following the success of their last joint venture, Agatha and Vondom have designed a collection of outdoor rugs characterised by the designer´s hallmark spontaneity and brightly coloured bold designs. The capsule collection comprises of red and fuchsia rugs come that come in three different sizes. Her unique and quirky vision of the world is communicated in the rugs´ offbeat shapes. Organic in nature, they work in perfect harmony with the natural surroundings; and their highly resistant material ensures their durability and longevity in the outside space. A colourful collection to inspire and brighten the outdoors, helping to create your dream garden.